This position paper explores the application of the Mechanics Dynamics Aesthetics (MDA) framework to the game ideation and design process, as employed during time-limited game jams and hackathons. MDA is a framework for understanding games that attempts to interlink the related disciplines of game design, game development, game criticism, and game research. MDA suggests that the components of a game can be broken down into mechanics, which describe processes and actions available in a game, dynamics, which describe the dynamics of actions reaction to each other in game, and aesthetics, which describe the emotional responses evoked in the player by the game. 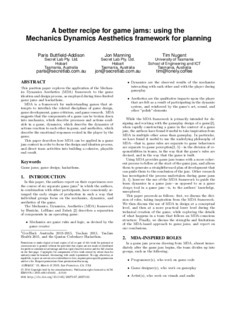 This paper describes how MDA can be applied in a game jam context in order to focus the design and ideation process, and direct team activities into building a cohesive, playable end result.